Volunteering at The Demonstration Garden on Joe Field Rd. The Class of 2013, as preceding classes have, was offered the opportunity to taste volunteering at a variety of sites during the Jump Start portion of our training. With great trepidation and much innocence, I purchase some pruning tools to begin my adventure in publicly putting class learning into action. So, one morning as scheduled, I got into my car and drove to the Joe Field Demonstration Garden. It was not difficult to locate the gardens on a map or to navigate the streets. When I got out of the car, I was greeted and welcomed by several experienced Master Gardeners who were very attached to the site and glad to see me. Is attached the correct word? Devoted to? Enamored by? In love with? I have discovered that the passion exhibited by those involved with the various sites is communicated with relish and joy. This was easily seen and felt as the Joe Field ladies divided me and my classmates into groups and took us on a tour of the variety of areas before assigning us tasks to perform. I recognized plants that live in my own garden but darned if I could name them. Voila! The Master Gardener leading my small group easily gave me the name of those plants and told me about their needs. I kept asking, “How’d she know that? How can she keep all this knowledge in her head and come up with it on a moment’s notice?” I wonder if I will ever be that familiar with plants. I was very aware of the phenomenal use of space. The areas were not particularly overplanted but were, nevertheless, packed with plants and more plants and provided inspiration and ideas to take home to my own garden and beds. There is so much going on in terms of what is growing that it is impossible to take it in with just one visit. Maybe that is a lure—come back and learn some more. Not a bad idea. 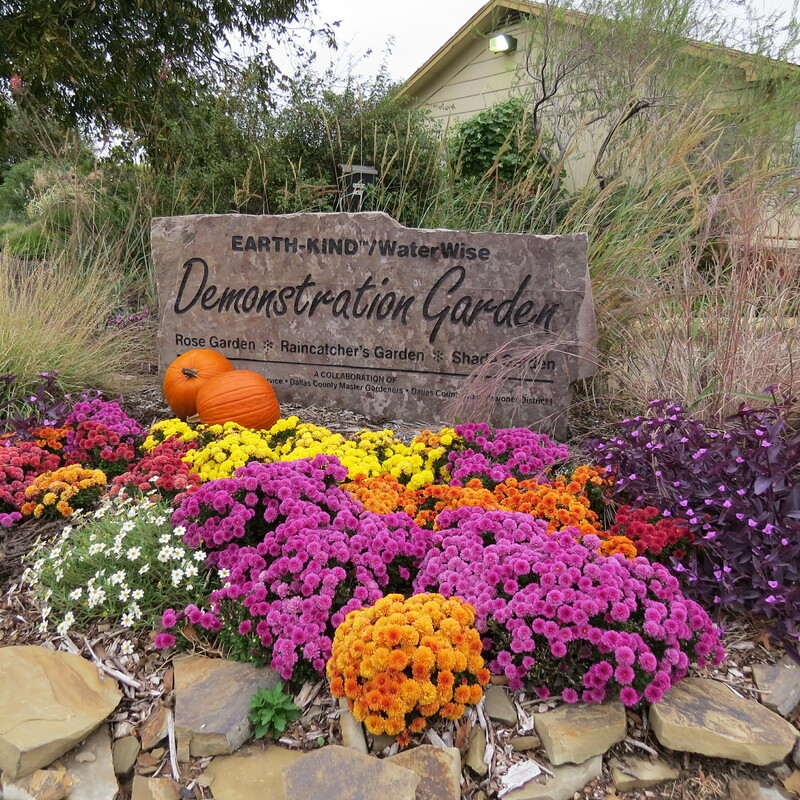 Between that chance to learn (and to serve) and the camaraderie of the seasoned volunteers, Joe Field Demonstration Gardens is a smart and happy choice for Master Gardeners. I’m glad I can visit and revisit this rich site. Tuesdays are the targeted day of the week for volunteering just in case you want to try it out. Maybe we will see each other and learn together. Map to our gardens here. Posted in Fall and tagged Dallas County Master Gardeners, WaterWise gardening. Bookmark the permalink. Great Zolene!! You will have interns heading for Joe Field, my favorite demo gardens! Thank you for this wonderful description. Your writing makes me wish that I lived closer to the gardens! We wish you did too, Aggie!